Some embroidery patterns are complex with lots of lines and stitches to follow. Why not create your own design that looks intricate, but is really quite simple? In fact, the pattern for this embroidered pumpkin is a cookie cutter. The pumpkin is a nice shape because it's a design that can stay on display from September–November, but you can use just about any autumn cookie cutter you want. Choose a size that fits in a 5-inch hoop so that it won't be so big that it becomes overwhelming. Working with three similar colors is a good place to start, but you can select any colors that suit you. The colors in my project are DMC 977, 921 and 780. When filling an area with embroidery, we often picture the stitching as being solid. This fill stitching is a little more open, and uses three detached stitches scattered throughout. The stitches in my project are lazy daisy stitch, detached wheatear stitch, and cross stitch. Choose the cookie cutter that will be your pattern and trace it on linen (or your favorite embroidery fabric) with a water-soluble pen. Place your fabric in an embroidery hoop. For more delicate stitches, use only two or three strands of embroidery floss. Choose a color to start with and thread your needle. Work the three stitch types around the traced shape. Leave some space between the stitches so you can add more stitches in other colors. Try to think ahead for creating an even dispersion of color. Keep all of the stitches within the outline. If you're using lazy daisy stitches, consider stitching partial flowers along the outline to help give the shape a well-defined silhouette. After you've stitched around the edge with one color, go back and fill in the gaps with the other two colors. Once you have the outline in place, continue adding more stitches to fill in the entire area. Rotate the stitches so they aren't all going in the same direction. This is especially important for the wheatear stitches, but also for the cross stitches. Rotating them also allows you to fit stitches in different places to better fill the space. Trade off the colors you are working with so you can see where you need to add more stitches and have an even spread of colors. And just as you want to distribute the colors, you should do the same with the different stitches. Sometimes you will have the same stitches next to each other, and that's fine! But try not to have too many clumps of the same stitches. As you stitch, work your way around within a small area with each new thread so you don't have to jump too far to the next stitch. The back of this embroidery will be rather messy, but the beautiful front makes up for it! 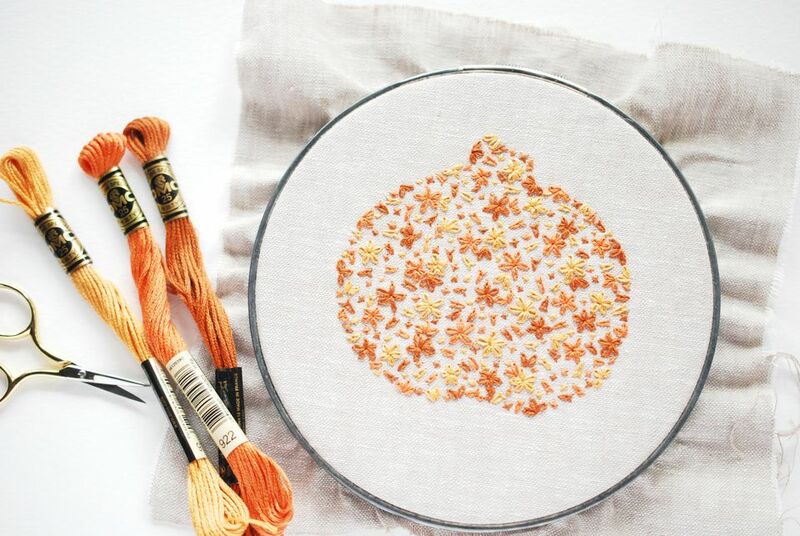 Frame your finished embroidery in a hoop and show off your gorgeous stitching (that is deceptively simple! ).